End of the afternoon back again in the hotel. 1:00 AM: Drive up to Ijen base camp. Approximately a 1.5-hour drive in a private car. 4:30 AM: Make it up the crater at an altitude of 2883 m.
7:00 AM: Hike down the mountain and drive back to your hotel. From your hotel we will take you back to Ketapang Harbour. 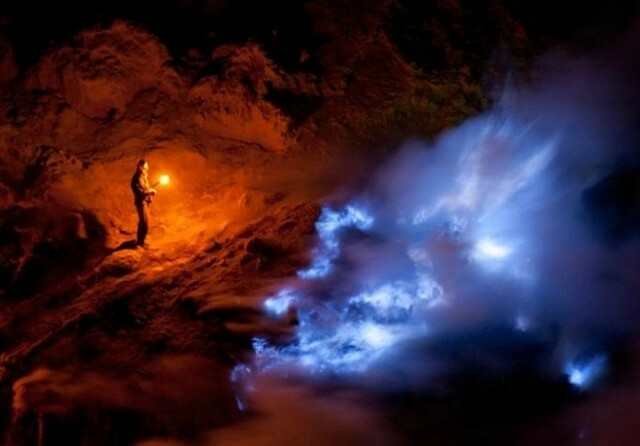 During the Mount Ijen Blue Flame tour enjoy some of the best panoramic views of Bali and Java. The sunrise casts a beautiful purple and pink light on the volcanoes caldera making the acidic lake a stunning bright blue. Take plenty of pictures of this unreal natural scene. On the tour, you will see sulfur miners climbing the crater and carrying 60-80 kg of sulfur on their backs - a dangerous and strenuous job. You can buy small sulfur carvings and crystals from the miners if you would like. If you are solo traveler or couple looking for budget options, we suggest you choose our OPEN TRIP price option, (at the bottom of the drop-down price option). Our open trip option places you within a group tour up the mountain and does not include accommodation or transportation from the harbor. It still includes transportation to the mountain, park entrance fee, and gas mask fee.